Polycrystalline higher manganese silicides (HMS) Mn(Al x Si1−x )1.80 (x = 0 to 0.009) were prepared by a rapid melt-spinning process combined with a spark plasma sintering method (MS-SPS). The phase composition, microstructure, and thermoelectric properties of the bulk samples were investigated. X-ray diffraction (XRD) patterns showed that all samples possessed the HMS structure, but minor amounts of the MnSi phase could be observed from the backscattered electron images. When the Al content did not exceed the solid solubility limit, the electrical conductivity of Al-doped HMS increased dramatically, and the thermal conductivity decreased, as a result of the enhancement of phonon scattering due to an increased number of defects. 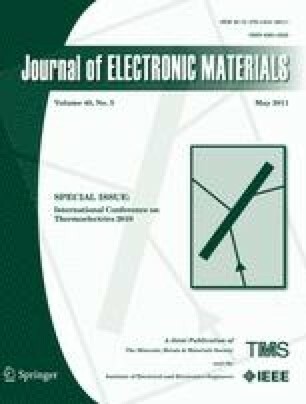 In addition, the maximum ZT value of 0.65 was obtained at 850 K for the sample with x = 0.0015, whereas further increase in the Al content (x > 0.0015) significantly deteriorated the thermoelectric properties, mainly because the Al content exceeded its solid solubility limit in HMS.